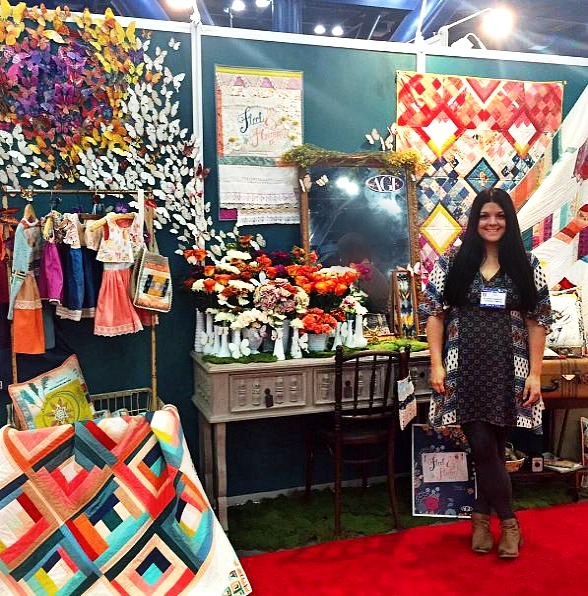 It's so difficult to sum up the experience of sharing your work at Quilt Market, to do a recap that does this adventure a justice. The truth is, it might take weeks for me to know and feel all the ways it has changed, inspired, motivated, and shifted me. Last year I left with tears flowing down, looking back at the city buildings as we drove away, feeling so many emotions and completely overwhelmed with the knowing that my own dreams were coming true. Of course it wasn't without some adversity. I left feeling on top of the world, but was very sick and returned home to what would become some of the most challenging times I've ever had. It took me months to get back on track and a lot of hard work, but this dream has been worth fighting for. A year later I felt in a much better place, things were going so smoothly and when some very unexpected family complications hit us a few weeks ago I had decided I shouldn't make the trip. Then my kids spoke up. They shared with me all the reasons they felt I should and could do this. That conversation is without a doubt the single, most powerful highlight of it all for me. As a mom who tries so hard to do it all but never quite feels like I'm doing good enough, there have been plenty of times where I've laid awake worried my kids would look back and see too many times where I was busy, tired, unhealthy, preoccupied. But what they shared with me, an emotional plea that they wanted to see me do this, all the reasons they are proud of me and excited to be a part of it. I wasn't expecting it and had no clue how much I needed to hear what my kiddos shared with me. My greatest wish & hope, the best possible scenario, of course, has been that the three of them will look back and see how badly I want them to be proud of me. To know & feel how much I love and credit them for inspiring me more than they could ever know. How dreams really do come true, with hard work and lots of passion. They gave me validation and so much more, a conversation that I carried with me to Houston and will cherish forever. 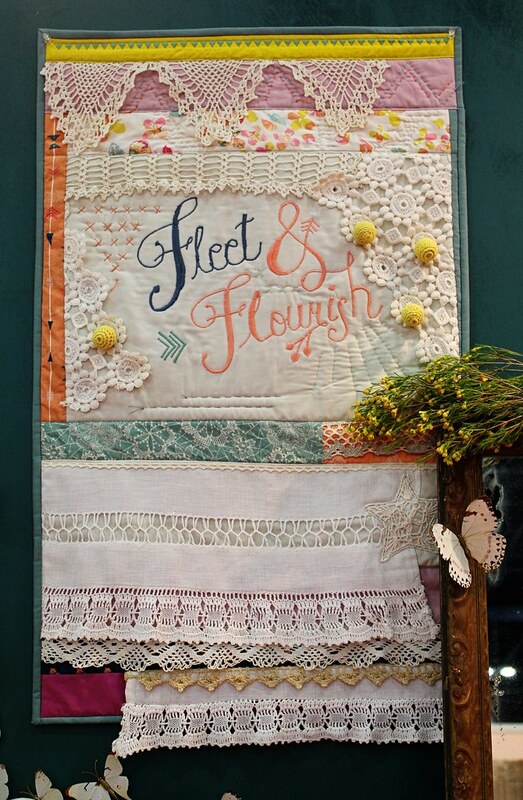 While at Quilt Market just a handful of people asked me about my collection name, Fleet & Flourish, and it's significance. to be alive. to grow, thrive, blossom. to curl, twist, & coil. It was impossible for me to create anything this past year that wasn't intertwined in grieving the loss of my dad, in my efforts to heal and build myself into something better around that loss, in accepting all that would be changed, and in deciding to live a healthier, happier, more passionate, love-filled life. These words fit perfectly and when I receive my yardage I plan to share more in detail. 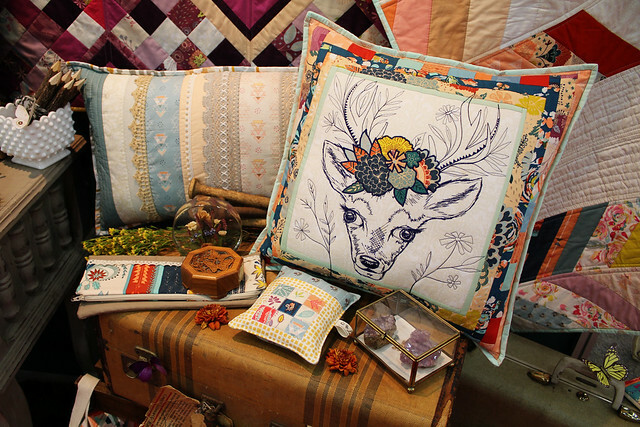 The theme for my collection and my space at Quilt Market, more than anything, is growth. I am really proud of what I created and I hope you enjoy these beautiful photos my friend Jayme Christensen took for me, plus a few of the special moments I was lucky enough to capture quickly. 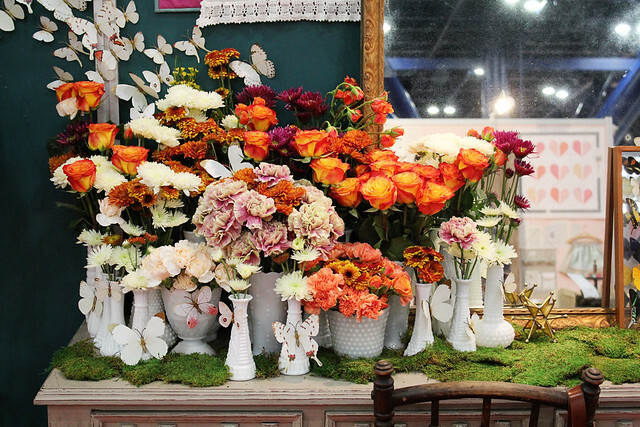 Your booth is beautiful, truly a work of art! WONDERFUL, all of it! Love the mirror...as in "You there, in the mirror! Fleet and Flourish!" :) I always look forward to more, Maureen! Simply amazing booth! Thank you for sharing the reason for the name Fleet and Flourish - makes the whole line that much more significant, emotionally. You are so amazing...know that there are many of us quietly cheering you on in the background! It's really lovely to hear how your children encouraged you. You must be a great mom to have raised such insightful kids! 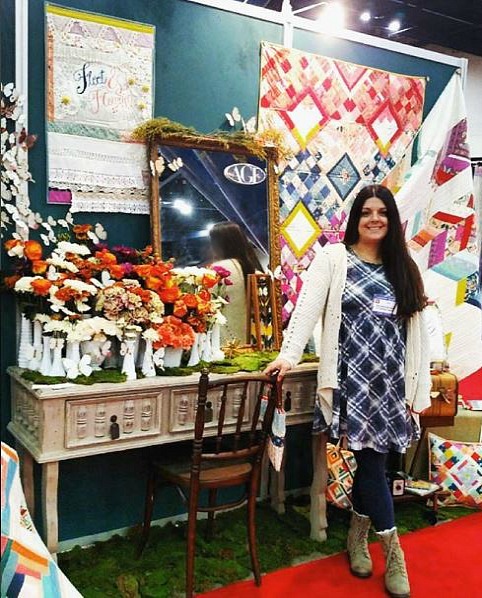 I loved seeing pictures of your booth and I'm looking forward to sewing with Fleet & Flourish when it becomes available! Oh, these are fabulous, but in person, it was breathtaking! So excited to see you flourish in your element! Thanks for lwtting me be a tiny part of it! I agree with Jessica! It was one of those masterpieces of art that can only be appreciated to the full extent when seen in person. I'm so glad I was able to be one of the few to take it all in. You should be so proud of yourself, and your amazing family!! Thank you for all of your hard work. Your booth is/was just fabulous. I wish I could have seen it in person. I'm so looking forward to taking your Craftsy class. 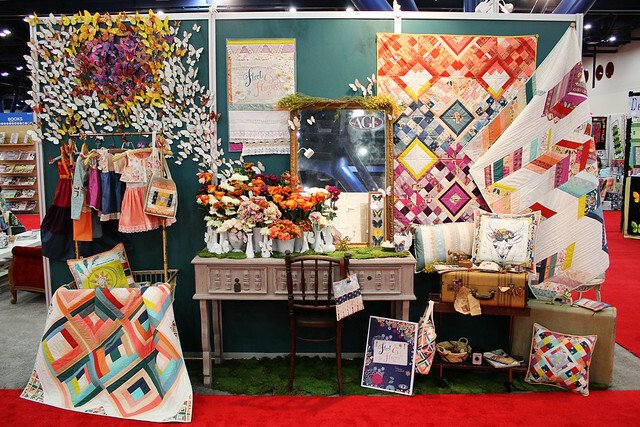 Maureen, your booth was wonderful! So beautiful and inspiring! Thank you for sharing your feelings on your journey. 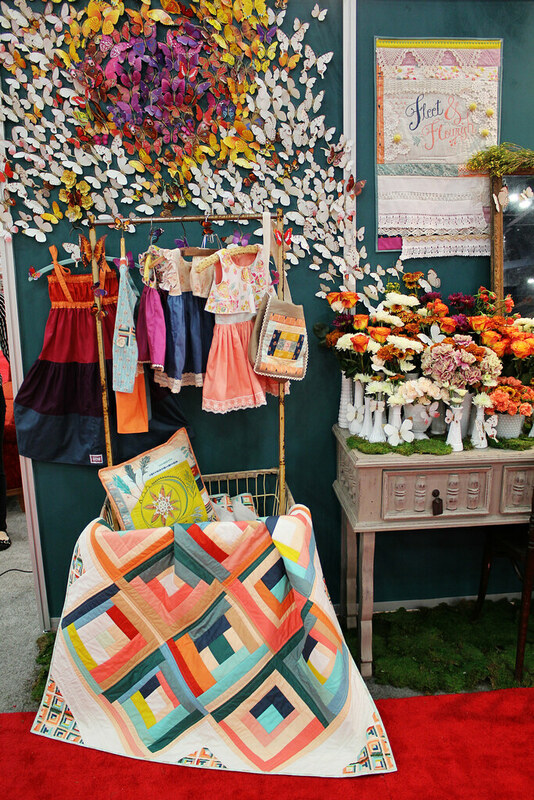 I love your booth, everything is so beautiful. Thank you for sharing your dreams! Beautiful fabric you created and the creations you made. Congratulations on showing your children to dream and share and their support of you. And your beautiful wood floors you came home to with your husbands hard work! Keep dreaming! And thank you for sharing, so wonderful of your children to be such support! But then they must be so very, very proud of the amazing mother! I am so happy for you. You are an inspiration. Awesome mom, awesome lady and awesome booth!! That is just wonderful crazy awesome!!!! you are so talented. Touching post today, Maureen. How wonderful it is to hear about your supportive family--your kids are learning a lot about living life, family connections, and supporting those we love. What an amazing job you and Kevin have done! What a lovely story Maureen. I am sorry about your Father and was moved about what wonderful children you and your husband must have. I wish you good luck in your endeavors. I waited a long time to do my own thing. I am happy you have the courage to do it now. 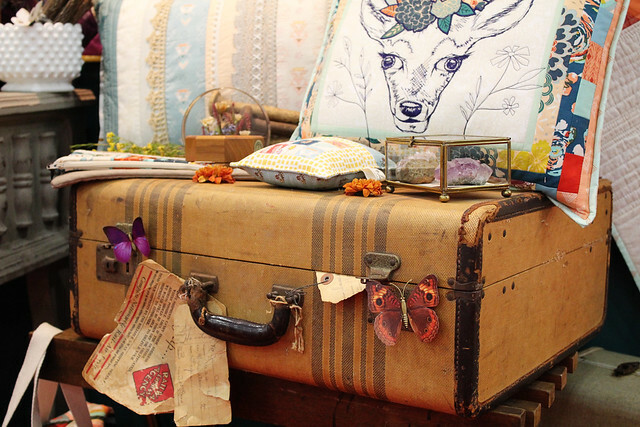 Beautiful post and fabric line. Thank you for sharing the intimate inspiration behind this line. i cant wait to sew with it. 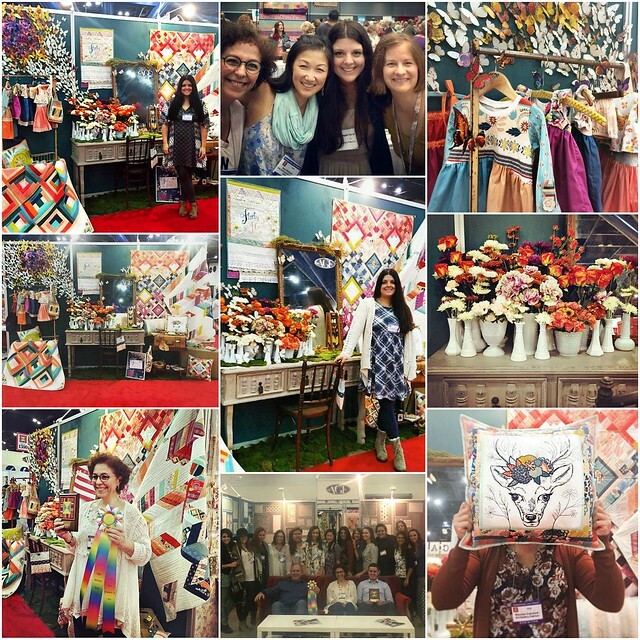 I so enjoyed reading your post about your journey and your wonderful family, your booth and your fabric are awesome!!! Maureen, thank you for being so real with your struggles and loss. So sorry for your great loss of your Dad, i loss my Dad some 9 yrs ago and it's still fresh in my mind. Your kiddos are the wind beneath your wings!!! Fly in there honor and soar!!! God Bless you and your family. Ohh love the items you displayed and gave me a great idea for incorporating my mom's dolies in a wall hanging!!! Oh my gosh. Best booth ever! 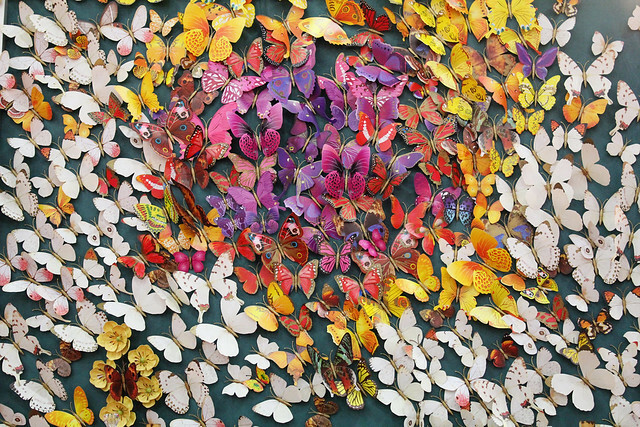 Where on earth did you get all those butterflies - awesome! Great job. Keep doing what you are doing and flow with the changes you are feeling. Wow gorgeous display!!! Way to go! I have been following your blog for several years. I was so proud of you and excited for you last market. I'm so glad your health was better for this one. Your booth just blows me away. The items you made with your new line are, as always, so artistic and so you. 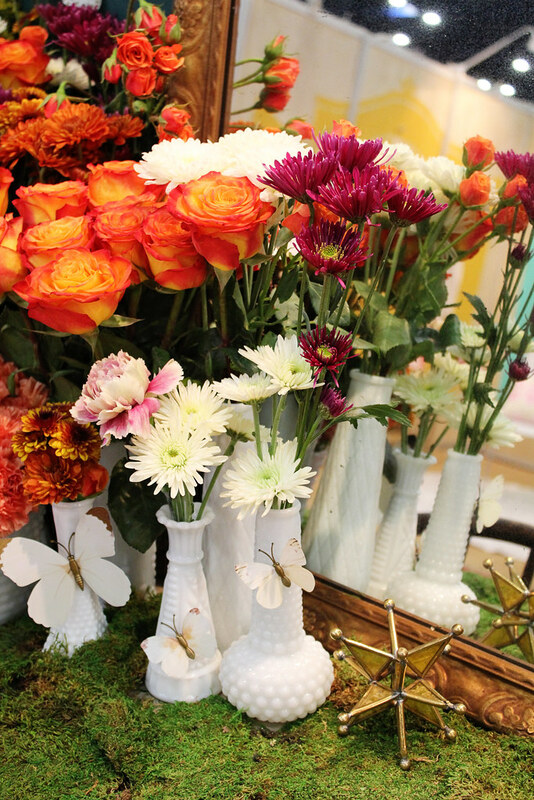 The vases of flowers with the butterflies emerging is just stunning. All the items placed feel as if you are telling a story. It was intimate, heart on your sleeve. It was you! I'm sure your kids are proud of you. Your booth is truly breathtaking! I wish I could've seen it in person. Thank you for sharing the meaning behind your creations. It makes them come alive. That "deer" has stolen my heart! Do you have a pattern so I can try to replicate or can I purchase it? Woodland creatures are so ethereal & peaceful. Love your stuff!